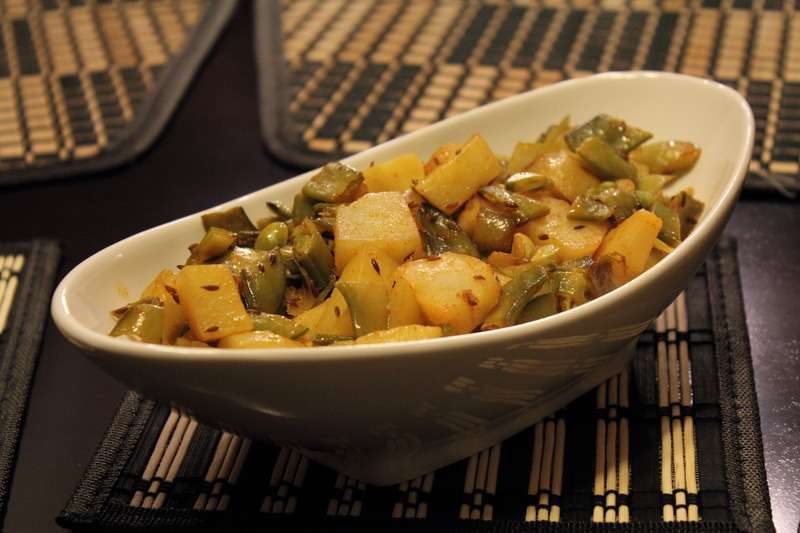 Semee Ahloo literally translates to flat green beans and potatoes. This is one of the many easy Indian recipes that’s great for vegetarians. Take out the stems of the flat green beans. Chop up the green beans into medium pieces. Peel potatoes. Then, chop them into medium sized pieces. Put the chopped up green beans and potatoes in separate bowls. Immerse them with water so they remain fresh. Peel garlic cloves. Cut the cloves in smaller pieces. Add the garlic cloves. Fry them for 2-3 minutes until they start turning brown. Drain the potatoes and green beans. Then, add both to the frying pan. Mix well. Cook for 3-5 minutes on high heat with the lid off to evaporate water from the vegetables. Cook for another 20-25 minutes on low heat with the lid on. Cook longer if needed. Potatoes will be tender once the dish is done cooking. Squeeze lemon on top if you’d like. Serve with an Indian bread like chapatti or naan. Hope you guys enjoyed this recipe. If you are a big potato fan, check out our other potatoes recipes. Check out some of our other Indian vegetarian recipes.